Ethiopian Airlines is proud to announce that it has taken delivery of the first Boeing 737-8 MAX 8 in Africa. The pictured MAX 8 was handed over on July 1by Boeing and arrived in the Continent on July 2, 2018 via a stop in Dublin, Ireland. The Boeing 737-8 MAX 8 features the new Boeing Sky Interior, highlighted by modern sculpted sidewalls and window reveals, LED lighting that enhance the sense of spaciousness ultimately boosting customers’ experience. The environmentally friendly aircraft has a minimal carbon emission and consumes 15% less fuel than the 737NG. With this delivery of the new ultra-modern aircraft, Ethiopian’s fleet of Boeing airplanes grows to 73 jets, including the 787 Dreamliner, 777, 737 MAX, 757 and 767. Boeing and Ethiopian Airlines celebrated the delivery of the first of 30 737 MAX jets for Africa’s largest and fastest-growing commercial airline. 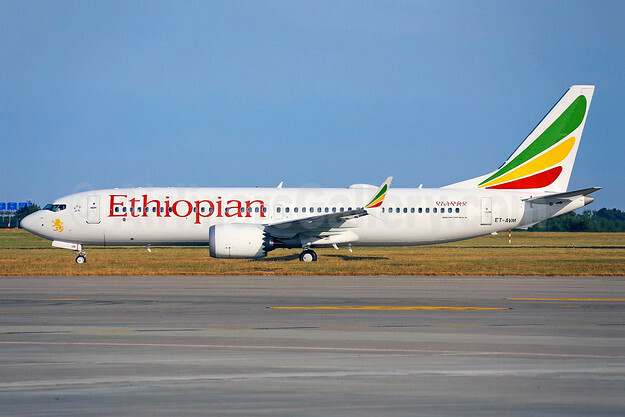 Top Copyright Photo (all others by Ethiopian Airlines and Boeing): Ethiopian Airlines Boeing 737-8 MAX 8 ET-AVM (msn 62446) DUB (Greenwing). Image: 942621. This entry was posted in Ethiopian Airlines and tagged Boeing 737-8 MAX 8, ET-AVM, Ethiopian Airlines, msn 62446 on July 2, 2018 by Bruce Drum.